Copper (Cu) provides interesting alloying advantages to steel and steel welds. Cu (atomic no. 29 and atomic weight 63.54) has a density of 8.96 gm/cc. The melting point of Cu is 1083 deg C while the boiling point is 2570 deg C. Cu is normally added to steel to increase corrosion resistance. Experimentation with the addition of Cu to structural steels for its ability to impart good atmospheric corrosion resistance properties began in the year 1916 in the USA. The first commercial use of Cu bearing steel as atmospheric corrosion resistant steel was during the period 1933 to 1935. Cu is beneficial to atmospheric corrosion resistance when present in amounts exceeding 0.20 %. The atmospheric corrosion resistance steels are also called weathering steels. Cu is added to steel in the form of pigs, refined ingots or as copper and nonferrous alloy scrap. Any Cu already present in the steel scrap charge is carried over into the liquid steel with little or no loss. Scrap electric motors containing usually 10-15 % Cu are often used as a source of Cu during steelmaking. Cu can be added either in the steelmaking furnace or in the teeming ladle. Both techniques of Cu addition give very high recoveries. Losses, if any, are due to the mechanical reasons. When addition of Cu is made in the steelmaking furnace, it should be done before the end of decarburization. The ability of Cu bearing steel to withstand atmospheric corrosion is not the major reason which provides the impetus for the development of Cu bearing steels today. Until recently, it was not fully recognized that along with the improved corrosion resistance, the precipitation of Cu can make a significant contribution to the mechanical properties of steel. Cu does not interact with carbon (C). The two elements are essentially immiscible. Therefore, all Cu in mild steel is dissolved or precipitated in ferrite, resulting in a slight hardening effect. The presence of more than 0.2 % of Cu in steel produces a characteristic checking on forging surfaces. The degree of this effect increases with the increase in the contents of Cu and C. The effect also increases with the increase in preheat time and temperature if heating is done in an oxidizing atmosphere. This happens because of the preferential oxidation of iron near the steel surface which leaves a Cu enriched zone containing the low melting ? phase on grain boundaries. In severe cases, the steel has hot shortness and is unworkable. Three solutions available to this well known problem are namely (i) preheating of steel in protective or non oxidizing atmosphere, (ii) carrying out the hot work only below 1090 deg C which is the melting point of the Cu rich phase, and (iii) addition of nickel (Ni) or cobalt (Co) in amounts which is equal to around one third to one half of the Cu content in order to increase the melting point of the Cu phase. The third solution is applied more frequently. For this reason some Ni is added to the high Cu steels. As the Ni content rises, so does the allowable forging/rolling temperature, although a practical limit in Ni content is signaled by the formation of a protective glaze at temperatures which is more than 1280 deg C.
In this context, it is to be noted that Cu bearing steels are not to be welded with an oxidizing oxy-acetylene flame. This can also cause preferential oxidation of iron, Cu enrichment, and hot shortness. If oxidizing conditions are avoided, Cu bearing steels can be welded without any problem with all the welding processes.The use of Cu as an alloying element has the advantage of increased strength due to the precipitation of Cu, whilst still retaining good toughness, weldability and formability even at low temperatures. Furthermore, these steels have a reported high resistance to fatigue crack growth, the ability to suppress hydrogen induced cracking, excellent corrosion resistance, and when Cu is combined with other microalloying elements such as B or Mo, an acicular or bainitic structure can be produced. Cu can contribute to solid solution strengthening of steels. This strengthening is at the level of about 12 MPa with around 0.5 % Cu addition. Besides solid solution strengthening, Cu can also increase the hardenability of steels. Further, since Cu is an austenite stabilizer, it lowers the austenite ferrite transformation temperature, which leads to finer ferrite grains in structure. Cu also increases strength through precipitation hardening if its concentration is more than 0.75 % in the steel. Cu produces this beneficial effect even though Cu and iron (Fe) have only very limited mutual solubility in both liquid and solid states. Maximum solubility of Cu in austenite is 2.3 % at 850 deg C, rising to around 10 % at 1450 deg C. In ferrite, Cu exhibits retrograde solubility to about 0.35 % at low temperatures which along with the sluggish precipitation kinetics of primary (copper-rich) ? – phase, makes possible age hardening of Cu steels. Even low amounts of Cu (around 0.4 %) can contribute to strengthening of the steel. The reasons, which can be solid solution and/or precipitation strengthening, are yet to be substantially confirmed. The amount of Cu added to steel depends on the desired effect and the end product use. Often, however, combinations of improved properties are possible if sufficient Cu is present. Cu contents from 0.15 % to 1.5 % increase hardenability slightly, but heat treatable cast steels rely on Cu more for its ability to improve fluidity and, as above, for age hardening.According to the Fe-Cu phase diagram (Fig 1), Cu has a relatively high solubility in austenite but is almost insoluble in ferrite. 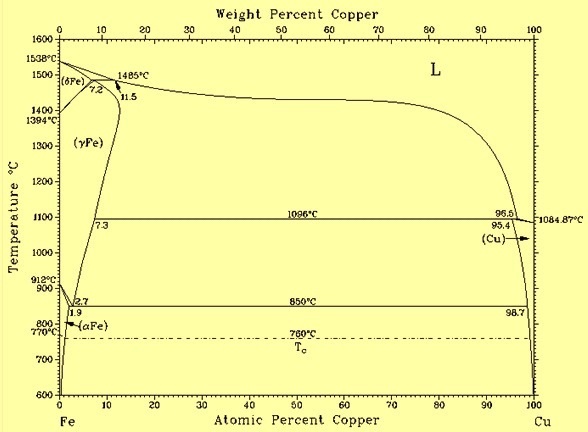 Hence, copper precipitation is expected to take place in Cu bearing steels. However, precipitation of Cu in steels with relatively low Cu contents (around 0.4 %) is still debatable. Cu dissolved in steel at high temperatures (such as normalizing temperatures) can be retained in solution by fairly mild cooling rates. Air cooling is sufficiently rapid for moderate section sizes. For subsequent aging above 400 deg C the typical treatment is holding for 4 hours in the range of 480 deg C to 540 deg C which precipitates a fine dispersion of spherical ? phase particles. Over aging changes these particles to a rod like morphology and again lower the strength to the solution annealed state. Aging raises the yield strength (YS), tensile strength (TS), and YS)/TS ratio, but reduces ductility and impact resistance. Age hardening Cu steels therefore contains other elements to raise the overall toughness of the steel to acceptable levels. Typical mechanical property changes in a normalized and aged 2 % Cu – 0.3 % C cast steel shows YS raised by 290 MPa, TS raised by 180 MPa, and elongation decreased by 10 % to a final value of about 20 %. Precipitation hardening can be used for additional strength in quench and tempered steels if tempering temperatures coincide with optimum aging conditions. Aging/tempering at 650 deg C nearly doubles the TS otherwise possible in a 1.5 % Cu-C-Mo steel. In terms of equivalent strengthening, it is possible to replace approximately 0.1 % – 0.15 % C with 1 % Cu. In annealed steels, Cu effects are limited to solution strengthening and improvements in mechanical properties which are correspondingly lower. 2 % Cu added to a 0.3 % C steel raise the YS by 130 MPa and the TS by 90 MPa. Ductility remains practically unchanged. Uses of Cu bearing steels around the world have included bridges, laboratory and office buildings, multi storey car parks and deep sea oil rigs. Cu bearing steels have been used in the USA in the construction of the US Steel corporation high rise building in Pittsburg. In Australia this material has been used in BHP Melbourne laboratories. Mild steels are specified with around 0.25 % Cu mainly for improving atmospheric corrosion resistance. This improvement is especially notable in industrial atmospheres where corrosion rates of Cu bearing steels may be two to four times less than for comparable carbon steels. Cu in steel improves paint adhesion as well, so Cu bearing steels will need lesser maintenance. The atmospheric corrosion resistance of Cu bearing steels is further increased if phosphorus (P) is also present. Advantage is taken of this fact in the production of weathering steels where, the improvement in corrosion resistance imparted by Cu and P is greater than that for either element alone. Cu also improves the corrosion resistance of stainless steels. An alloy containing 20 % Cr (chromium) and 1 % Cu has good resistance to nitro-sulphuric acid and has therefore been used in the manufacture of explosives. Steel containing 16 % -20 % Cr, 1.0 % – 3.0 % Si and 1.0 % – 2.0 % Cu is resistant to sulphites and is used in the pulp and paper industries. Cu improves the resistance of austenitic stainless steels to sulphuric acid: an alloy designated ‘Stainless 20’ containing 20 % Cr, 27 % Ni, 3 % Mo (molybdenum), and 2 % Cu has been specifically designed for this type of service. Large tonnages of copper bearing HSLA steels, including weathering grades, have been produced for many years. Aging grades typically contain 1 % – 2 % Cu; less will be specified for corrosion resistance and a little solid solution strengthening. HSLA copper steels are contained in ASTM specifications A242, A440, A441, A572 and A588, among others. Guaranteed minimum values of YS range from 290 MPa to 550 MPa. Age hardening Cu 0 Ni – Cu -Nb steels with even higher strengths have been produced but have found only limited acceptance. The slightly increased hardness caused by the presence of Cu in amounts that enhance atmospheric corrosion resistance can make the steel unsuitable for deep drawing applications. The advantages of standard HSLA steel is that it is having good combination of strength, toughness, and weldability and can be produced at a very reasonable cost. A number of HSLA steels have been developed which depend upon Cu to meet their specified properties. During the early 20th century, experimentation began to see what impact Cu can have as an alloying element. The results showed significant further improvement in the overall mechanical properties of the HSLA steels including a higher resistance to fatigue crack growth. In combination with Cu additions, low C content is also essential for attaining the desired effects and during the last three decades, research has also extended to comparing the benefits of hot rolling versus quenching and tempering to make further gains in quality of the material properties. Interest has recently been renewed in the design of HSLA steels which exploit Cu as an alloying element. The use of Cu as an alloying element has the advantage of increased strength due to the precipitation of Cu, whilst still retaining good toughness, weldability and formability even at low temperatures. Furthermore along with high resistance to fatigue crack growth, the ability to suppress hydrogen induced cracking, and excellent corrosion resistance. When Cu is combined with other microalloying elements such as B (boron) or Mo, an acicular or bainitic structure can be produced. The addition of Cu in HSLA steels has been found to greatly benefit the strength levels of steels used for among other applications, offshore structures, pipelines and ship hulls. Cu containing HSLA steels, typically HSLA-80 and HSLA-100, are of particular interest for large submarine and offshore structures, pipelines, hulls of ships, etc. and these applications often demand a combination of strength, toughness and weldability.